‘We Made Every Living Thing from Water’ (وجعلنا من الماء كل شيء حي) will have its premiere at 6pm today (22 November) at Metropolis Cinema, Sofil as part of the Beirut Art Film Festival. The screening (free attendance) will be following by a Q&A with the directors and Human Rights Watch’s MENA Deputy Director Lama Fakih, moderated by Habib Battah. When we started making ‘We Made Every Living Thing from Water’ we knew the environmental situation was bad, but we didn’t realise how truly bad it was until we travelled around the country. But despite seeing – and smelling – so many polluted water ways, piles of trash and our first cameraman getting sick from filming a burning trash dump, we did not normalise the situation: it is shocking, and the health ramifications for the public now and in the future is truly alarming. The opening paraphrases the Communist Manifesto – ‘A spectre is haunting Europe – the spectre of communism’. This was a deliberate choice, as environmental degradation and climate change is the biggest challenge facing the planet, on top of the political-economic and social challenges that mankind has continued to face since Karl Marx and Fredrich Engels wrote those notorious lines in 1848. It is a challenge in ‘developed’ and ‘developing’ countries alike, albeit to differing degrees, and the advanced economies may indeed end up like Lebanon if they do not address environmental degradation, with polluted waterways and the public forced to buy water as tap water cannot be trusted. Certainly many countries are environmentally worse than Lebanon, but the immediate concern is the country one lives in, how it impacts the food you eat, the water you drink, and the air you breathe. 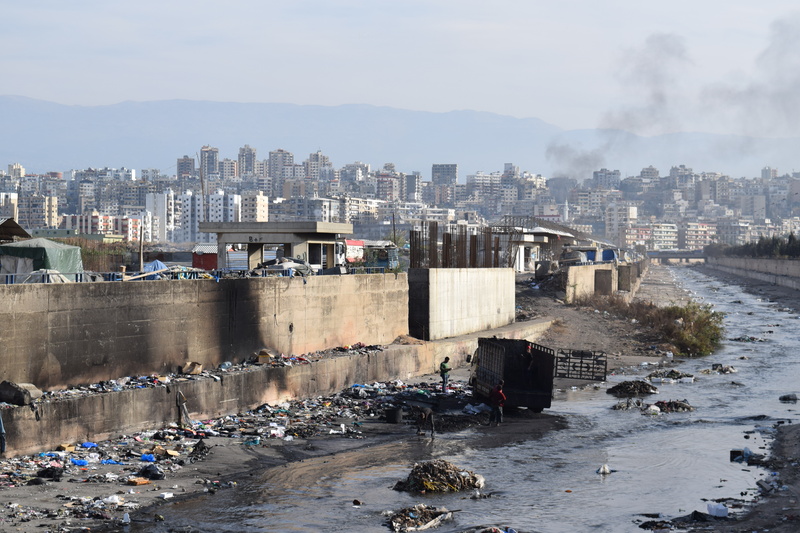 Lebanon is not in a position to say, as the Caretaker Tourism Minister did recently – and later apologised – that the country is not as polluted as Egypt, that it is not that bad here. The end of the opening sentence comes from the title of a Noam Chomsky book, Profit Over People, which was again a deliberate choice, as the pursuit of material gain is imperiling every living thing on this planet. Both paraphrases reflect our ideas of a solution to Lebanon’s and the world’s environmental crisis – ecological socialism based on a sustainable economy and an equitable, just society. The private sector will not solve Lebanon’s or the world’s problems, especially in countries run, like Lebanon’s, by oligarchies. This is why we featured municipalities and ‘ordinary people’ in the documentary, as we believe change can happen from the grass roots up, by empowering local communities to actively participate in decision-making to decide how best to protect their living environments, as we state at the end of the documentary. Why did we make this documentary? The idea was initially sparked by our first cameraman, Alan Gignoux, wondering why Lebanon has water problems in the summer of 2014, which was particularly bad in Beirut, with the soundtrack of the city the throbbing noise of water delivery trucks’ diesel generators pumping water to rooftop tanks. We, photojournalist Alan and independent journalist Paul Cochrane, also wanted to make our first documentary about an important socio-economic topic. Karim Eid-Sabbagh had written his PhD thesis on the political economy of water in Lebanon, and Paul had proof read his thesis. Karim’s insight would be crucial to the documentary’s development, and Karim joined the project as a co-director with Paul. This was fortuitous, as funding happened to be available from Canada’s IRDC through the American University of Beirut’s Department of Public Health. We had planned to self fund, but that funding enabled us to pay for transportation, editing, colour correction and the recording studio in the post-production process in 2017. As we started making the film, the July 2015 trash crisis occurred, and we knew that would be a core part of the documentary’s structure. We started filming after that polluted summer, and experiencing the pollution, seeing it with our own eyes and smelling the reeking trash, brought home how bad the situation was as we travelled around the country. We were ‘lucky’ that the interviewees were still angry and outraged about the trash crisis, adding passion to their explanations of the impact of trash leaching into the groundwater and the burning of trash on the environment. We also discovered it is not always easy filming in Lebanon. We ran into a few issues – despite having permission to film from General Security. ‘Don’t film here, it is not allowed’ in Southern Lebanon; in Beirut’s southern suburbs; in downtown; and we were chased out of the construction site of the Jannah Dam in Nahr Ibrahim. In Tripoli a shoe was thrown at Alan when filming, and then a stone, by a young man shoveling filthy black soot into the Abu Ali River – people don’t like you filming them doing something illegal. As so often with research, we ended up with more material than we needed, but not enough ‘cutaways’ – images between interviews to accompany the voice-over – requiring Paul to pick up a camera when Alan, based in London, was not in Lebanon. We ended up with a first cut of over an hour long, so shortened it to make it more digestible for the public. As for the title, it is from the Qur’an, and we saw the Sura used during a demonstration in Anjar (وجعلنا من الماء كل شيء حي) and found it would make for a suitable, if slightly provocative title, and the recitation beautiful. We finished shooting in spring 2017, and had a shorter, final cut by autumn, and started screening it at selected venues, including the American University of Cairo, the University of Liverpool, the London School of Economics (LSE), and the Ecole Nationale d’Agriculture de Meknes in Morocco. In February 2018 we had the soft opening at the Issam Fares Institute at AUB. Coverage of the screening in the Daily Star and Le Orient Le Jour led to a request from the Beirut Art Film Festival to have the documentary at the festival, where it will have its formal premiere on 22 November, as well as be shown at 3,000 schools and at 16 universities and cultural centres throughout the country. Unfortunately, during the post-production process, further research came to light that we couldn’t include in the documentary: the spectre of micro-plastics. Paul had worked with OrbMedia interviewing people in Beirut whose tap water tested positive for microplastics, but the research could not be published until OrbMedia had released its report worldwide. Their results are shocking. Out of the samples taken in Beirut, 94% of tap water contains microplastics, on par with the USA, and more than in India and Indonesia, at 82% and 76% respectively, and Europe at 72%. 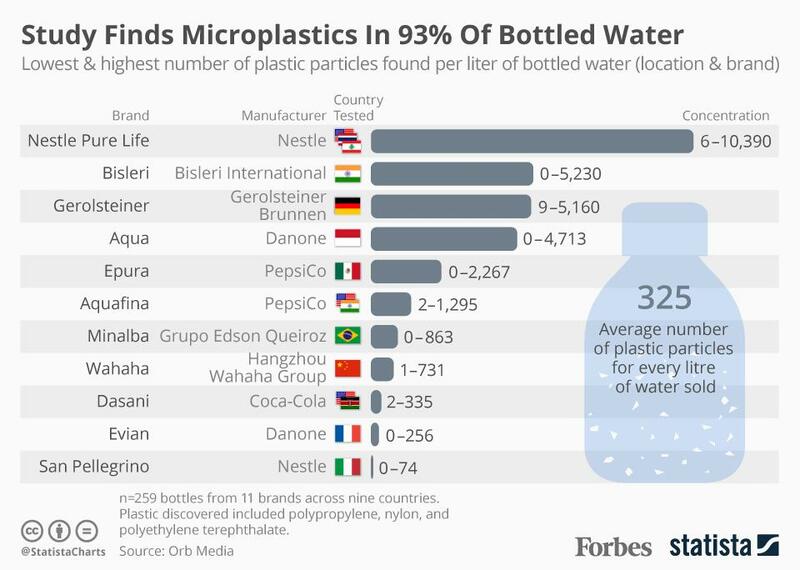 Then in 2018, OrbMedia released a report on bottled water, finding 325 plastic particles for every litre of water sold worldwide, and 93% in Nestle Pure Life in Lebanon. 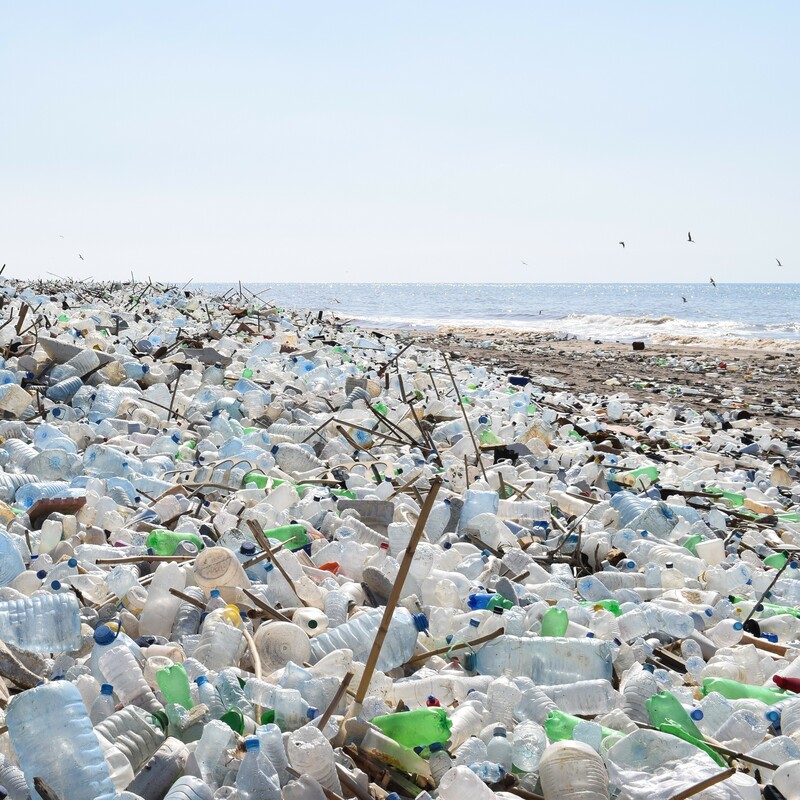 The plastic discovered in bottles includes polypropylene, nylon and polyethylene terephthalate (PET), which are toxic to human health and the environment. Further research has shown microplastics present in half of all freshwater insects, and in human excrement. We are only slowly understanding the negative impact of microplastics and how prevalent they are – and in Lebanon, water bottles are a major contributor, as the opening shot of the documentary shows, with Paul walking, up to his knees at times, through plastic bottles on the Costa Brava beach by Beirut’s airport. But micro-plastics don’t just come from plastic bottles – the particles come from tyres, paint and synthetic clothing, microbeads (in cosmetics) and all plastics that breakdown into our environment. It is another problem on top of heavy metals, pesticides and environmental degradation that Lebanon has to contend with. If we had been able to incorporate the microplastics research, it would have made a fitting ending line for the documentary to accompany the footage of two turtles stuck in a tyre in the Litani River: the inhabitants of Lebanon are like the turtles, stuck in a tyre, in a polluted river, trying to get out. As for the turtles, we didn’t try to rescue them – as a few viewers have wondered – as it was too risky to enter the river, but thankfully one did manage to climb out and escape. We have been asked a lot about practical solutions, as we purposely didn’t include any as we believe it is not the role of journalists to do so, but the people and governments to decide on how to solve the country’s environmental degradation. Furthermore, there are quite a few possible solutions, and it would have taken time to explain such solutions, which would have taken away from showing the problems Lebanon faces, as surprisingly (including us at first), many do not realise the extent of the pollution. Ultimately, the solution is a political one. That is why we also wanted to explain how Lebanon got into this situation, which we believe no documentary or TV programme has adequately done before, particularly the political-economic background, such as the research of Dr Jad Chaaban at AUB into the connection of politicians and bank ownership, and how that impacts on public debt. I missed the premier at the Metropolis in Lebanon where sndwhen is the next screening? I missed the screening at Metropolis Beirut when and where is next screening? Hi there, I would check with the filmmaker. Do you need contact info?